Washington – Every year on World AIDS Day, we stop to reflect on those we’ve lost to the fight against HIV/AIDS. While we have made important progress in treatment and advances toward a cure, this year the struggle to end the pandemic is facing a new challenge: The Trans-Pacific Partnership (TPP) trade deal. How can a trade deal impact the fight against HIV/AIDS? 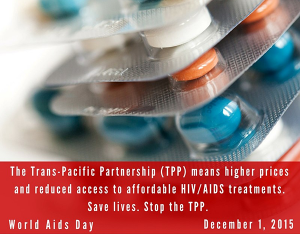 The TPP would extend the patent on some drugs – including many of the most effective HIV/AIDS treatments. This change would have a dramatic effect on access to safe and affordable care for millions of people worldwide. For example, Oxfam reports on an academic study that shows if the TPP were in effect today, more than 50% of those living with HIV/AIDS in Vietnam would lose access to their medications. There are over 250,000 people living with HIV in that country alone.